STEM schools can help young people gain the skills necessary to succeed in these fields. 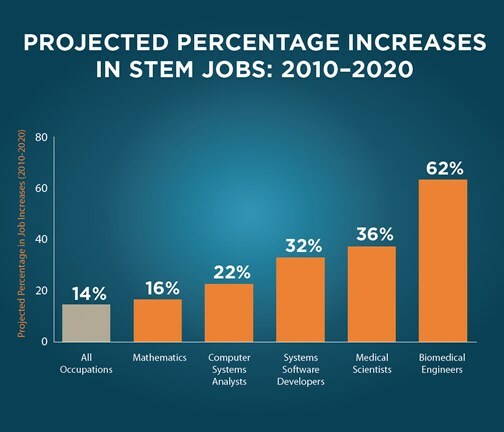 Over the next decade alone, the U.S. must produce approximately 1 million more STEM-degree graduates than currently projected to meet the demands of the economy, according to a 2012 report by the President’s Council of Advisors on Science and Technology. Recognizing this gap, educators have focused on getting more students hooked on math and science earlier in their school careers, which is why more STEM programs are being launched nationwide. Utilizing 3D printing capabilities is a great opportunity for STEM training. It helps get students excited about what they are learning and it provides a tangible way for engineering students to test and produce designs. DC Jaeger is proud to supply the Afina series of 3D printers. As an example, the Afinia H-Series 3D Printers come fully assembled, providing a true out-of-the-box printing experience for students. The software for the H-Series 3-D printer is easy to install on both a PC and a MAC. The Afinia H-Series 3D Printers can prototype a part or model, within .10mm (4 thousandths of an inch) accuracy, that have 30% of the strength of injection molded parts. Proven to increase test scores and retention by as much as 33%*, the 3D AVRover helps inspire students and enhances STEM training and instruction. The 3D AVRover integrates the best in hardware, software, and content to provide a truly remarkable 3D learning experience. Bringing your STEM lessons to life is easy with the 3D AVRover. This unique system gives you the highest quality 3D videos, interactive objects, and virtual simulations that will make your lessons come alive. Find out how the AVRover system will help you enhance your STEM instruction.